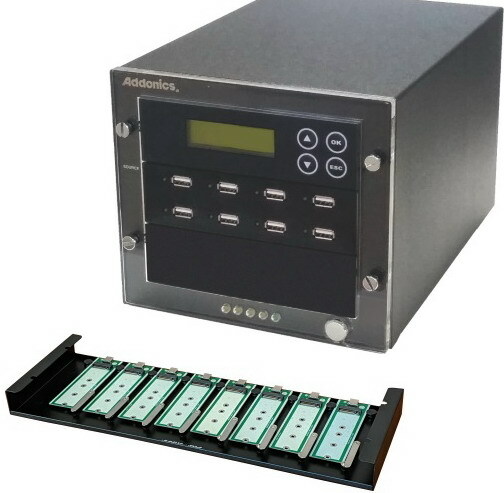 Addonics Technologies (www.addonics.com) today announced a 1:7 USB NVMe/Flash/HDD Duplicator that copies up to as many as seven (7) M2 NVMe SSD at a time. The duplicator includes a docking station that is equipped with eight (8) M2 NVMe - USB 3.1 adapters. The docking station connects the M2 NVMe SSD to the USB port on the duplicator. The M2 NVMe SSD can be easily mounted onto or removed from the docking station without using any special tools. There is no computer or software needed to run this USB NVMe/Flash/HDD duplicator. Simply attach the master drive to the source USB port and the slave drives into any target USB ports, press the "copy" button and the duplication process starts automatically. Besides duplicating M2 NVMe SSD, this duplicator can be used for making copies of USB flash, USB SSD and USB HDD. Each USB port is designed to provide adequate power to operate the M2 NVMe SSD or self-powered USB storage device, including most 2.5" USB hard drives. This duplicator is also a handy piece of equipment for transferring content among M2 NVMe SSD, USB flash/SSD or USB hard drive. The 1:7 USB NVMe/Flash/HDD Duplicator comes with a full suite of functions. Some of the functions include the option to copy just the files or the whole media; the drive sanitizing function; the option to copy from a larger drive to a smaller drive; and the option to copy HPA. The whole media setting copies the drive sector by sector and this setting can copy drives in any kind of file system or format, including an encrypted drive or even a blank drive. Drive sanitizing options include Quick ERASE, FULL ERASE or multiple ERASE with DoD standard. Price for the 1:7 USB NVMe/Flash/HDD Duplicator is $1,199.